The mask-and-ring handles bring this bottle into the category of relief carving. They are of the most common style, apparently a court style of the eighteenth century. We have proposed that in many cases the addition of such handles became almost second nature on many Official School bottles and other known court wares (see under Sale 4, lot 34), allowing a bottle like this to be viewed almost as an undecorated example. 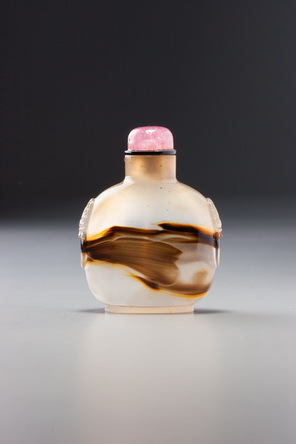 This falls into the category of banded-agate bottles, which were a common type for probably a considerable part of the snuff-bottle period. Bands of concentric lines are not only standard to agate, they define it, and in large, evenly formed crypto-crystalline masses, they commonly create large enough areas that if cut through at the appropriate angle, a bottle is formed with plain chalcedony above and below a roughly horizontal band, a band that was supposed to be reminiscent of the broad belt worn by an official. The large numbers of such bottles attest both to the commonness of the material and to the popular appeal of what was done to it. In the case of this bottle, the markings are sufficiently unusual and dynamic to consider their ink-play potential as, perhaps, a landscape. 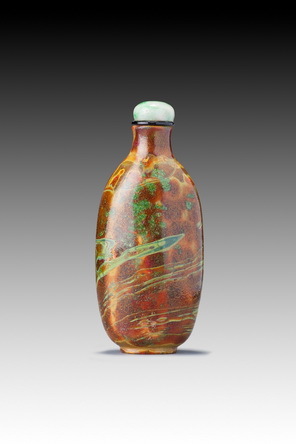 The likely date for this bottle is the second half of the Qianlong period but we cannot rule out the early nineteenth century. The only possible hint of second-phase workmanship here is the shallowness of the recessed foot. It is exquisitely well formed, symmetrical, and neat, but unusually shallow. Whether this is a hint of the decline to come or was dictated by the extensive hollowing is difficult to judge. To have had a deeper recession would have meant either increasing the depth of the footrim or reducing the degree of hollowing above the foot area, both of which would have increased the weight of the bottle and altered its balance in the hand, which is currently difficult to fault just the way it is.